Bringing up Bella: And the Purple Sparkly Toilet Seat goes to.... Us! And the Purple Sparkly Toilet Seat goes to.... Us! So in the last week, I have almost broken my wrist, prepped (read: banged head against) my PC for the OS upgrade I'm about to undertake, rescued a lost dog and celebrated the last official birthday I shall ever recognize. (If my father could remain 29 for 50 years, I figure I can be 49 for at least 30.) And as if I wasn't far enough behind on the blog, let's just say typing with one hand surely didn't help matters. It is however, time for me to stop whining and thank some very lovely people for some very lovely things they have said about us in the last month. Not the least of which are the lovely Mums and dog over at Declan's Dogs Blog. First, let me tell you, when we found out that we were on 'the short list' of Deccy's Excellent Blog Award, we were pretty honored to even be mentioned among such fine blogs and entries. But wait, I'm assuming you all know who Deccy is - the infamous Greyhound of Declan's Dogs Blog fame? If not, you seriously must go check out the fabulous ex-racing Greyhound that is the Dec-Man! Witty, charming and devastatingly handsome, this is a dog and blog not to be missed! Okay so now, where was I? Oh yes, we were quite honored to even be considered for Deccy's "Excellent Blog Award" for March 2012 so when we found out we actually won it, well, let's just say bragging was done all over. Except for, you know, here because once again I couldn't quite get my act together until now to thank Deccy's lovely Mum for sending it to us. Here it is in all its sparkly goodness. It's kind of funny because we won it for a Wordless Wednesday post I actually labored over posting and then suffered massive panic attacks over once I did. (Saying I'm an introvert is so understating the issue...) I was worried it was too personal, too intimate to share and no one would want to watch a slideshow of a long-gone friend and his loving family. What a learning experience that was. Anyway, it did seem to touch a few people, not the least of which was Deccy's Mum who had her own experience with a 'sainted' canine, Deccy's beautiful predecessor, Flynn. Seems Flynn, much like my Beau, has been a tough act for Deccy to follow. And as difficult it has been to lose Beau, and understandably Flynn, I wish every one of you reading this blog, your very own sainted canine in life. So, okay, enough rambling. 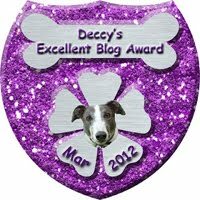 I'd like to accept this Most Excellent Blog Award for March 2012 (aka the Purple Sparkly Toilet Seat) on behalf of all the Flynns and Beaus in our lives. The dogs who weather our storms and mistakes and teach us grace in the process. The ones who are just this side of extra-special, the ones we can trust to always do the right thing even when we don't and the dogs who love us and do us proud no matter how many times we screw up on them. But I'd also like to accept it on behalf of the dogs like Bella and Deccy who, for all their quirks and foibles, will no doubt leave their own very special hole in our hearts no other dog can fill when it comes their time to visit The Bridge. Each unique and extraordinary in their own way. Thanks Deccy's Mum. Your kindness is well appreciated. And while I'm on a roll, I also want to take a moment to acknowledge another special occurrence and thank the blogger responsible for it. You see, a few weeks back we entered a contest over at Roo's Doins. Roo and Roo's mum make some of the most inventive stuff in Blogville from Pet Fiction Theatre Theater (sorry, crossing the pond even on a blog can take a moment ;) to their Monthly Jigsaw Puzzles and their recent "It Takes a Thief" contest. So when they were sponsoring a contest to giveaway some new creative software they'd reviewed, we signed up. If they liked it, we figured we'd like it too, if we could ever suss out how to use it. And well what do you know - we ended up winning! We've already downloaded the software but are waiting to really dig into it until after we upgrade to Windows 7 (no comments please). For such a computer nerd as myself, this was a lovely gift to win and I promise Roo and his mom that as soon as we get a chance to dig in, we'll produce some fun scrapbook pages to show off what a cool prize it was. In the meantime, if you want to see what someone with talent can do in just a short time reviewing the product, click here to check it out. What playing we have done has been fun and we really appreciate the prize. It will be put to good use (just as soon as I can get this darn OS installed and working properly.) Thanks again, Roo. Congratulations on your award - I loved that post :) I'm behind too . . .but I don't have as good of an excuse as you do - I hope your wrist is feeling much better! Can't wait to see what you create with the new software! Congrats on your award, it was so well deserved! As for the wrist - ouch! You know I can relate, I take it the paranoia about hurting it again never really goes away? I'm quite envious; I can't imbibe on wine. It would surely make it all so much easier! So very glad it's "only" a sprain, though. Phew. Congrats on the sparkly toilet seat! That was a great blog post and you totally deserve it. Thank goodness wine opening is in your marriage contract. Otherwise I don't know WHAT you'd do! I'd like to extend congratulations as well on a well deserved win. The video touched many of us --- glad you posted it. And what a lovely acceptance speech --- ditto what BassetMomma wrote --- you almost made me tear up again as well. A well deserved win on the sparkly purple toliet seat, your posts were so touching and your acceptance speech was pawesome!! Yay - congrats on the win and loved your acceptance speech!! congratulations on your award and your win! that software looks awesome.